Just had a baby? Relax, lie down and breathe a sigh of relief. The Mother of All Baby Books has arrived! From the author of The Mother of All Pregnancy Books, comes the guide that all new parents have been waiting for, whether they know it or not. The Mother of All Baby Books is the instruction manual that Mother Nature forgot to include with your new bundle of joy. 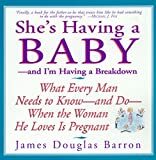 Packed with important advice and insider tips to coping with the joys and challenges of caring for your new baby, this comprehensive, refreshing guide is an excellent resource for first time or even experienced moms and dads. Warm and delightful, The Mother of All Baby Books offers a wide range of topics including basic childcare, nutrition, health, and physical, emotional, and social development. Inside you'll find the facts about sleeping patterns, breastfeeding, circumcision, and immunization issues, as well as charts and tables to bring you up to date on the latest information, a handy glossary of baby-related terms, and insider secrets on shopping for baby. Get the inside scoop on how to handle colic, diaper rash and all those pressing questions that have you pacing the floor at 3 a.m.! With an extra-added dose of reassurance, discover what it's really like to become a parent in this bible to babyhood and beyond! ""The Mother of All Baby Books provides excellent advice for topics that are easily overlooked during the pregnancy/baby adventure."" -Sandra Gookin, co-author of Parenting For Dummies and Parenting For Dummies, 2nd ed.